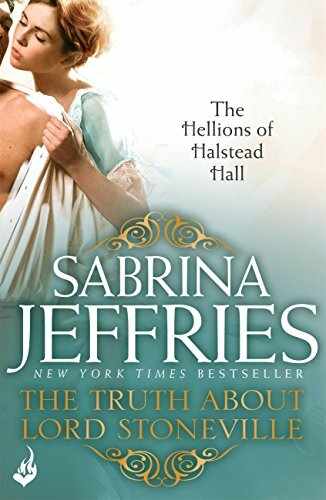 The first book in the Hellions of Halstead Hall series by New York Times bestseller Sabrina Jeffries. Sabrina's wickedly sharp, sizzling historicals will be loved by fans of Sarah MacLean, Eloisa James and Julia Quinn. The oldest of the scandalous Sharpes, Oliver Sharpe, the Marquess of Stoneville, like his brothers and sisters, has lived life on his own terms. In his case, as an unrepentant rakehell. Or so life had played out until Grandmother Hetty got a bee in her bonnet. Now the five Sharpe siblings face a daunting ultimatum: Marry by year's end - or kiss their inheritance goodbye. Oliver vows to fulfill the bargain in true Sharpe style - by bringing home a fake fiancé from a brothel! But his scheme backfires when he foils a robbery and rescues an American beauty instead. Maria Butterfield came to London to find her missing fiancé, but her prior engagement won't stop Oliver from getting what he wants: Maria in his bed. His rebellious charade may just call Hetty's bluff, but not before it becomes all too real - stirring up a love that tempts him to be a hellion no more. For more delightfully romantic and charming historical romance, don't miss the rest of Sabrina's Hellions Of Halstead Hall books. And don't miss her other glittering series including: The Sinful Suitors, The School for Heiresses and The Royal Brotherhood.